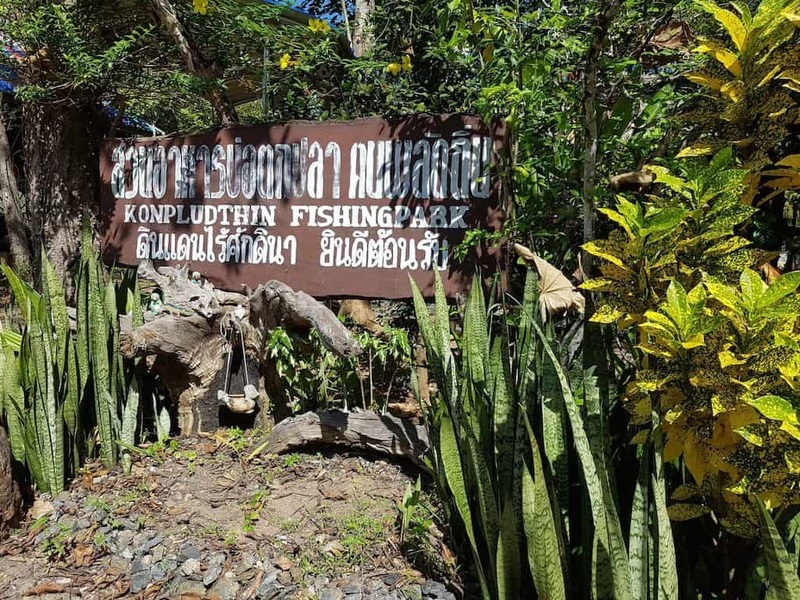 If you are looking for a unique place to eat in Trat, you can’t go far wrong with Konpludthin Fishing Park. 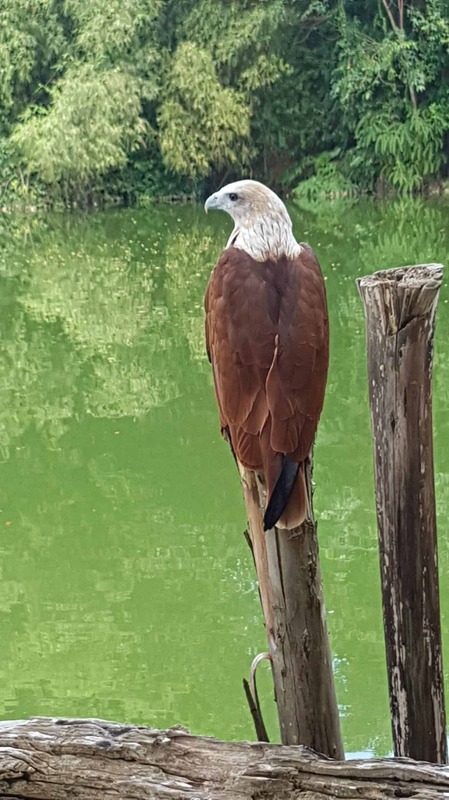 It’s a great place to relax, drink beer, eat Thai food, fish and get to see hundred of eagles close up. Take the road south of Trat green city for less than 10 minutes and take a left turn towards Laem Sok Pier. Approximately 3 to 4Km from the junction on the left hand side your come upon a couple of large eagle sculptures that mark the entrance of Konpludthin Fishing Park. Over a decade ago, a large pond was dug out of the earth to form a fishing hole. 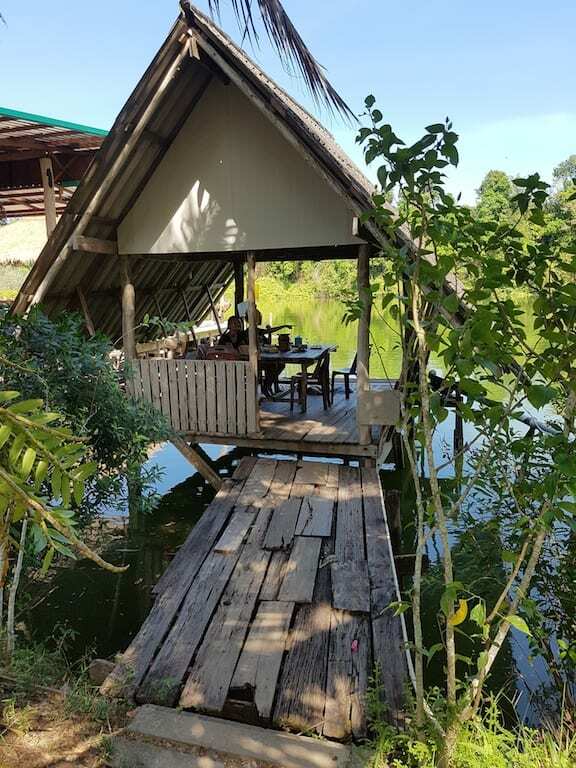 Now with a family run restaurant serving hot and spicy Thai food you can hire a fishing rod for 150 baht or bring your own and fish while you eat and drink a cold Beer Leo or three. 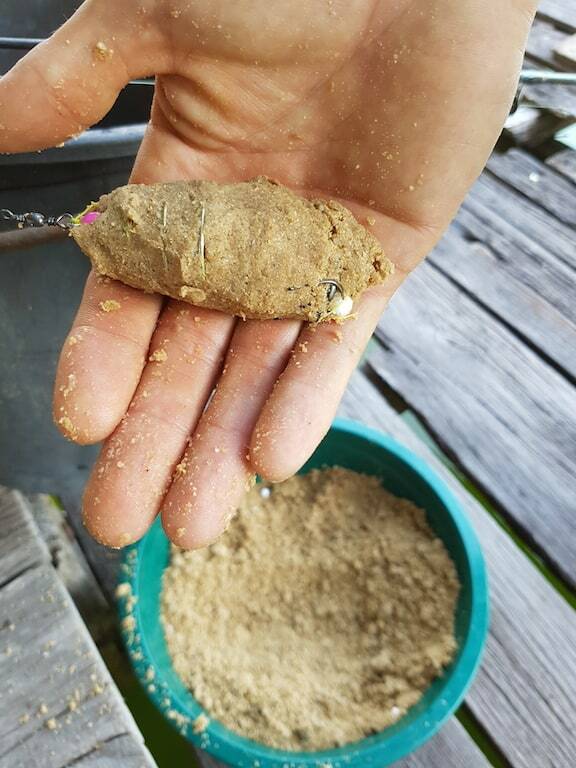 Fishing at Konpludthin Fishing Park consists of compressing ground bait around a coil and two hooks (see the photo above). This was a new experience for me having only used floats and weights fishing as a boy in England. Still it seamed to work as I caught one small fish which we threw back. Mind you, you should have seen the size of the one that got away! 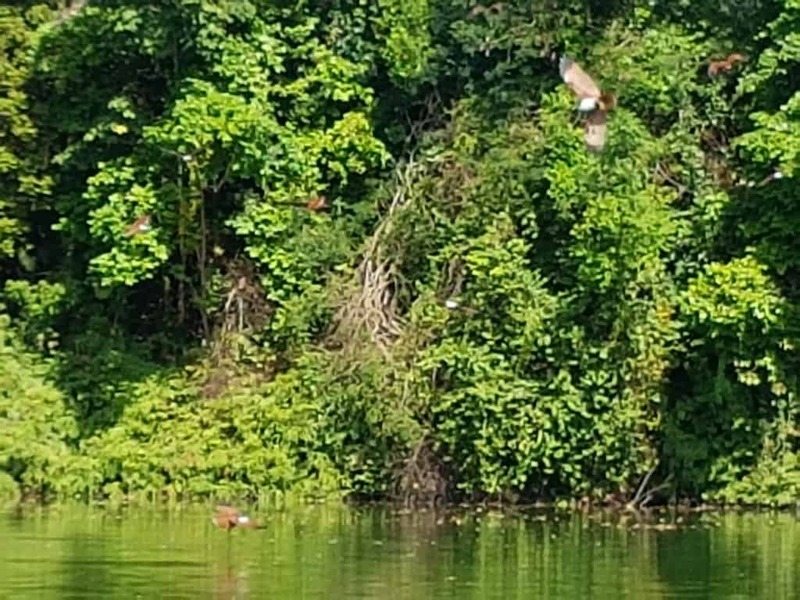 The park owners paddle out to the far side of the pond in a kayak several times a day from noon and disperse chicken guts out into the waters. The pond is surrounded by tall trees and mangrove where many a Brahimy Kite AKA Red-backed Sea Eagle nest. 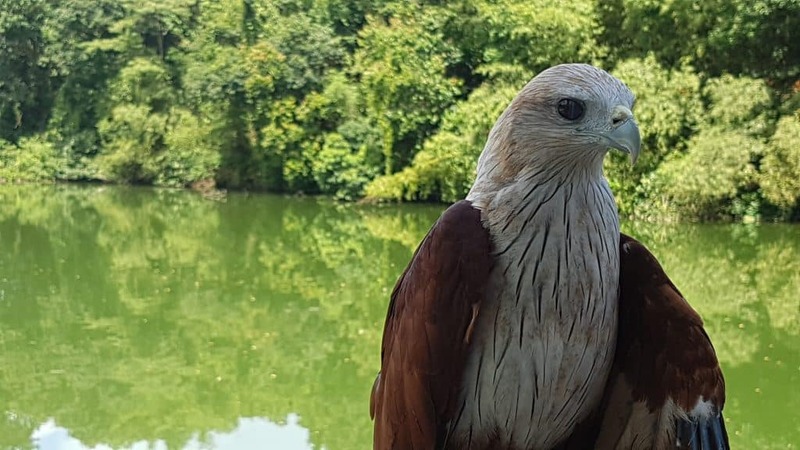 These beautiful and majestic birds descend on to the ponds to pick up the easy food. It’s an incredible spectacle to witness these raptors up close and in such large numbers. There’s maybe a hundred or more! Just remember to bring a long lens for you camera to get better photos then I took on my phone. The Red-backed sea eagle is a distinctive bird of prey not unlike the American eagle, only smaller. The adult birds have a reddish-brown plumage with a contrasting white head. Konpludthin Fishing Park is a favorite of ours. It’s family friendly and a wonderful place to get back to nature, eat good food, laugh with friends and marvel at the eagles feeding. 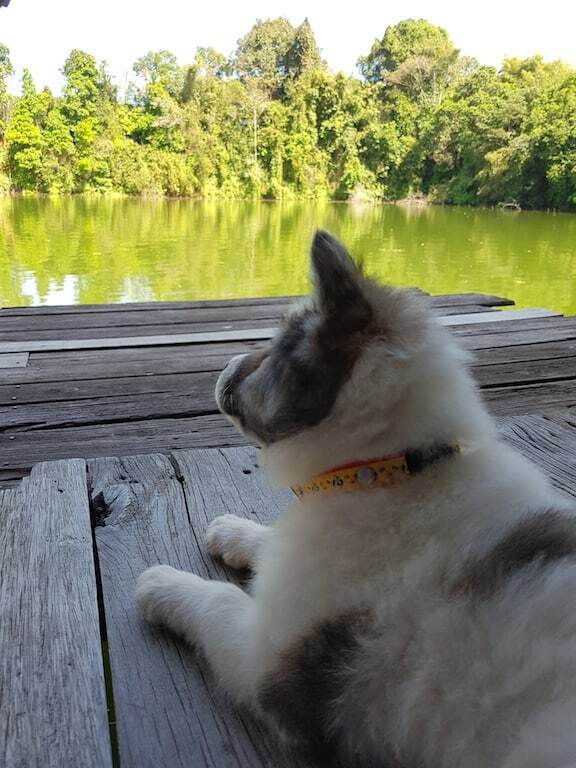 Even Taxi likes to relax here by the waters edge out of the midday sun. Highly recommended! 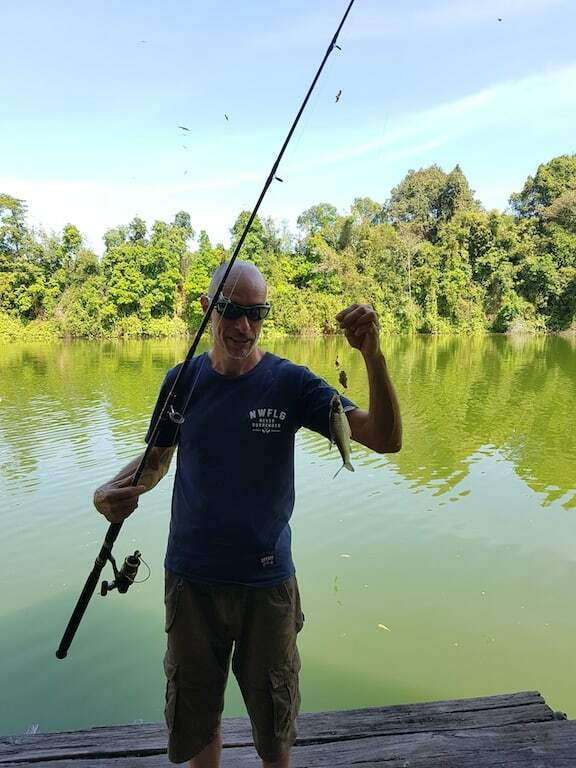 If you have visited Konpludthin Fishing Park or have anything to add to this post, please leave your comments below. Join us on Facebook and follow us on Instagram for more exclusive images from our corner of amazing Thailand.